From November 2015, Learning Disability Today will no longer be available in its print or digital format magazine format. But this does not mean it is the end of Learning Disability Today. We will continue to be your one-stop destination for all of the latest news from the learning disability sector - and editor Dan Parton will continue to provide opinion and analysis on the Learning Disability Today blog and invite guest bloggers to share theirs. You will continue to receive a Learning Disability Today newsletter, with a round-up of the latest news, as well as information on upcoming events and publications from Pavilion Publishing and Media. 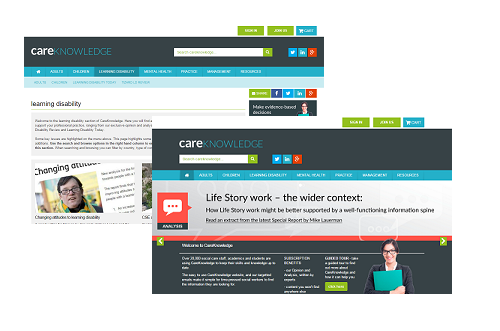 Current subscribers to Learning Disability Today will receive free access to CareKnowledge – the online practice and evidence-based resource for professionals working in social work and social care, for the remainder of their subscription. We understand you are likely to have a few questions regarding your subscription to Learning Disability Today so we've included some FAQs below. What happens to my Learning Disability Today subscription? If you have an individual print and/or digital subscription to Learning Disability Today, you will shortly receive an email from us detailing your free access to CareKnowledge, worth £120 per year, for the remainder of your subscription. However, if your subscription runs out before your next issue of the magazine is due, you will still be given one-month’s free access to CareKnowledge as a thank you for being a Learning Disability Today subscriber. If you have an institutional or multi-user subscription to Learning Disability Today, you will shortly receive an email from us detailing your free access to CareKnowledge, worth £120 per year, for the remainder of your subscription. When will I receive my CareKnowledge login? You will receive your login details in an email from us shortly. Where will I be able to see Dan Parton's features and blog posts? Our editor, Dan Parton, will be a regular contributor on CareKnowledge and you will be able to keep up-to-date with the latest news and policy changes in the learning disability section of the website. Will the Learning Disability Today website still be available? Absolutely. You will still be able to have www.learningdisabilitytoday.co.uk as your go-to website for all the latest news and views from the learning disability sector. I am not happy - who do I talk to? If you’re unhappy with unlimited access to CareKnowledge (worth £120 per year as an individual subscription) for the remainder of your Learning Disability Today subscription term, please contact our customer service team on +44 (0)1273 434943 or email them at info@pavpub.com and they will be happy to issue you with a refund.